Register online by selecting Full Conference Registration, add it to the shopping cart, and proceed to check out. The Full Registration Includes: Conference packet, Reception, Four Meals, Workshops, and Souvenir Book. If you do not plan to attend the entire conference, you may select the event(s) you plan to attend, add it to the shopping cart, and proceed to check out. 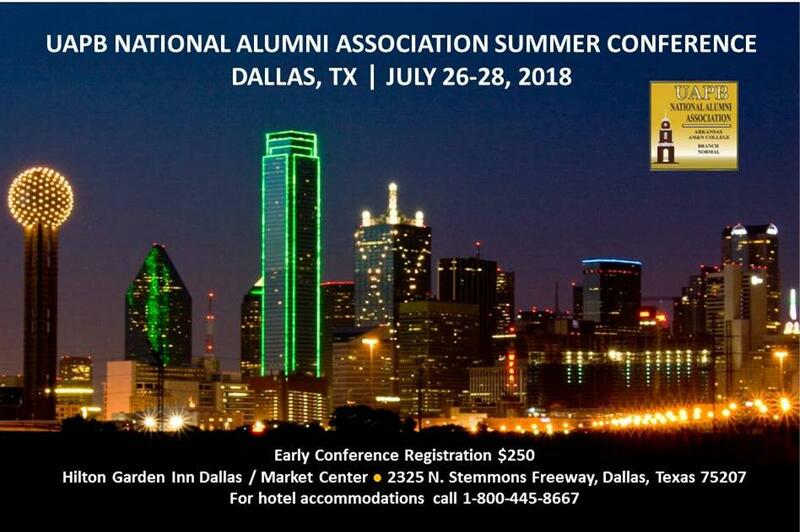 The Dallas-Ft. Worth Alumni Chapter will host the 29th UAPB/AM&N National Alumni Summer Conference. The planning team is very excited to welcome you to the BIG "D" where they have some great things planned for the conference. There will be workshops, guest speakers for the luncheon and general session, a student recruitment fair and University updates by campus administrators. Chapter President Chapter Vice President UAPB/AM&N National Alumni Assoc.